The USCA “_Best of Local Business_” Award Program recognizes outstanding local businesses throughout the country. Each year, the USCA identifies companies that they believe have achieved exceptional marketing success in their local community and business category. These are local companies that enhance the positive image of small business through service to their customers and community. _”While Filta is proud of its impact as the green movement, environmental responsibility is merely a byproduct of good business for FiltaFry,”_ says Filta Group CEO Victor Clewes. Filta Group was chosen for their relentless pursuit of business opportunities that promote green initiatives. The company has a long track record of providing services to business owners that allow them to run more efficient restaurants and commercial kitchens. Their original offering FiltaFry offers cooking oil recycling and fryer management. The service allows clients to eliminate the burn incidents that are common in most commercial kitchens related to filtering or disposing of waste cooking oil. It also allows them to increase the usable length of their cooking oil, and improve the taste of fried foods because of higher quality cooking oil and better understanding of the frying process. Using their highly advanced micro-filtration technology, Filta has purified enough cooking oil to fill even the largest football stadium. This recycled oil drastically reduces the need to produce, transport, and dispose of additional oil for cooking. 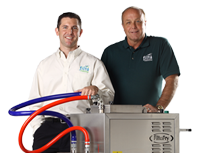 As of recently, Filta Group has expanded their initiative past just FiltaFry. They recently rolled out a multinational effort to introduce FiltaCool, a humidity control system for refrigeration units such as commercial refrigerators that conserves energy, prolongs air-condition equipment life, and reduces spoilage. Each of their two offerings focuses on helping restaurants and commercial kitchens control costs, liability, spoilage, and waste. Victor Clewes remarked on the achievements saying that Filta was grateful for being recognized for its efforts. He also remarked on the expansion in the early part of 2010 of Filta’s additional green services such as waste oil pickup and recycling under the name of FiltaBio.